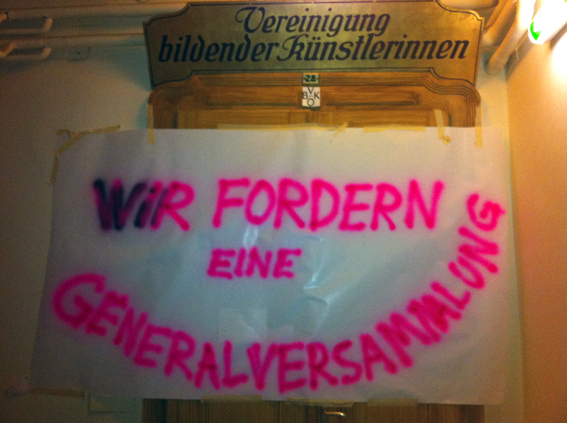 This public statement is being issued out of necessity by members and former-members of the Austrian Association of Women Artists (VBKÖ), in response to neglect for democratic governance by its current president, Rudolfine Lackner. The VBKÖ was established in 1910 and holds an important position in lobbying for women’s rights in the arts. We, the undersigned, believe the organization is currently going against its commitment to fair representation and democratic governance through the actions and behavior of its current president. Lackner has been the president of the VBKÖ beginning with 1998. Although we have been involved in the activities of the VBKÖ before 2010 (its centennial anniversary), the association accepted few new members on this occasion – and this was solely the decision of the president. What this membership entailed has never been concretely stated, other than a € 100 membership fee requirement. From 2009 to 2011, we mainly did unpaid work for the VBKÖ in the form of linking it to networks, artists and theorists; providing knowledge and content; translating and proofreading; designing printed matters; contributing to the VBKÖ’s publications; organizing materials, equipment and transport; curating events, discussion rounds, symposia, readers and exhibitions; and representing the VBKÖ in jury sessions. Rudolfine Lackner began her presidency without being elected and has continued to occupy this position since 1998 – without once organizing formal elections as stated in the regulations (at most issuing statements to the members that she would simply remain in her position.) Due to a lack of transparency, contesting this decision on a legal level was hard to undertake. It was never clear if Lackner’s statements should be taken as a de facto election, or which public space could be otherwise used to bring these problems to the fore. Constant personal conflicts between the president and the members only aggravated this situation. These are just some of the reasons why the VBKÖ did not have an inclusive organizational structure for years. We believe a more engaged group of members would counterbalance the president’s position of absolute authority. Further, a members’ forum would openly expose the exclusions taking place and eventually elect another president – if these shortcomings would be openly discussed amongst a greater plurality. Shortly after a small and short-lived VBKÖ members’ structure was established in 2010, Lackner tried to abolish it. Other strategic moves included concealing the decision-making process and suppressing information on what project members were involved in. Additionally, all major decisions were never shared with the members, not to mention the public. No election or consultation ever took place when “erasing” or pressuring out members, nor when accepting new ones; thus, a general sense of isolation among members and a feeling exclusion from fair and equal participation dominates the organization. We believe Lackner’s reasons for avoiding a general assembly are that such an assembly could lead to a majority of the members voting to elect a new president of the organization. In the past, many current and former members have shared their stories about these abuses and the urgency for fair governance. By establishing a general assembly, no president would have exclusive access to the historical archives, sole control over the decision-making process in the organization or be entitled to manipulate public resources for one’s personal benefit. We demand a general assembly to discuss the above-mentioned topics, as our given rights! We believe in this institution and its potential for women artists and are ready to fight for it !